Although adding a drainage system is necessary for many basements, homeowners are understandably concerned about the appearance of the installed system. For basements where a standard drain system is too large, we have the FlowGuard Thin Floor Drain System. This system fits smoothly underneath thin floors, providing a clean, finished appearance. The Thin Floor Drain System is equally as effective as any of our other drainage systems. Our drain system is the ideal way to waterproof a basement with a thin concrete slab floor. To schedule a free drain system installation quote, contact us by phone or e-mail today! 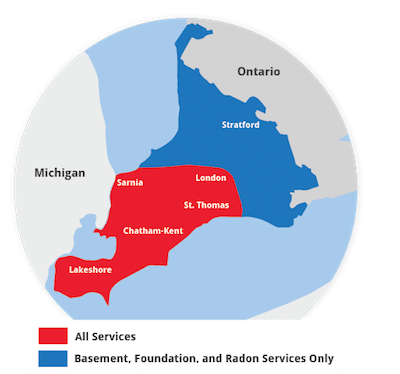 We're proud to serve the Ontario area, including Sarnia, London, Windsor, Chatham and nearby. We restore your floor! Once our installation crew has installed your drain system under the basement floor, we'll restore the removed portion of the slab with fresh concrete. Our free quotes are offered to homeowners within our service area (the Ontario area, including London, Windsor, Chatham, Sarnia, Stratford, Windsor , Leamington, St Thomas, Amherstburg, Strathroy, Essex, Ingersoll, Kingsville, Aylmer, Goderich, Hanover, Listowel and many areas nearby). Each quote includes an on-site inspection and measurement of your basement, a consultation where we make recommendations and answer all your questions, and a customized, written cost quote.